Descartes believed all truth could be discovered through reason alone, including the best course for human affairs. While Descartes was undeniably brilliant, his hypothesis was faulty. No amount of reason can take into account the sheer number of interactions humans do in a single hour, let alone a day, a week or a lifetime. Additionally, no amount of logic can successfully divine the intentions and thoughts of an individual mind. Where the ancient world was adrift in legends and gods whose purpose was to give meaning to chaos, the age of reason was filled with magnificent theories meant to bring “equality” to order. The creation of social theories by the French philosophe movement was meant to bring into being an orderly Utopia based on human reasoning. Inevitably, instead of fulfilling Utopian dreams, their disembowelment of France’s ancient order created a nightmare. Unfortunately, the pattern laid down by French Revolutionaries created a template for all who followed them. Like a superstitious conjurer, the left creates demons upon which all the ills of society can be blamed. Harnessing the resulting anger, they direct it at the foundations of society itself. Finally, they take advantage of the disorder they have created to grab power. In most cases, their evil is based not on ill will, but the false belief that what they do is for the greater good. When Mao’s minions marched across the countryside, they did so with the greatest of intentions and purest of anger. By destroying the old order, they believed they were creating something inherently better. Similarly, Pol Pot’s followers believed extermination of the wealthy would mean more for everyone else. As Che Guevara played music to calm the nerves his executioners, those doing his bidding believed the “enemies of the people” deserved to die. Similarly, those killing police officers in the United States see their deeds as justified by the lies they have been told. Though the demons of Eris are not always devils, their puppeteers know exactly what they are doing. President Obama’s back handed compliments to law enforcement do not go unnoticed, nor do Hillary’s tirades on black injustice. Their inflammatory rhetoric has given tacit approval to the cop killings that have now happened from sea to shining sea. 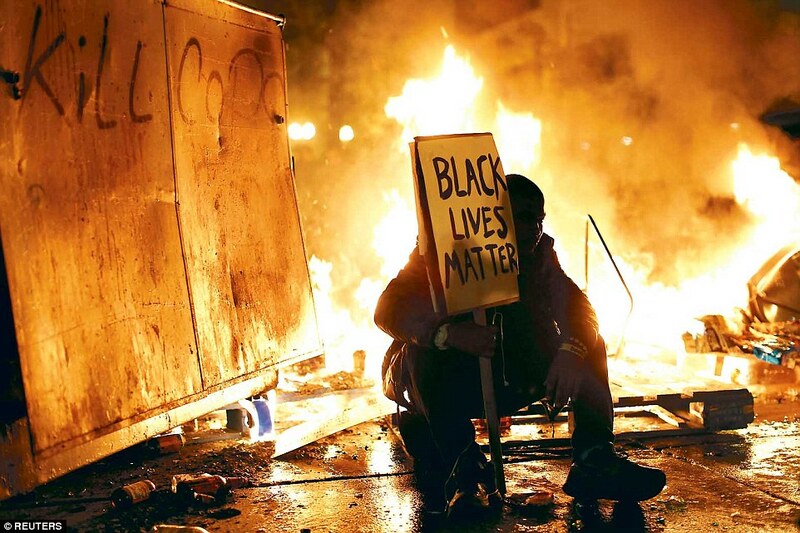 It is no wonder that Black Lives Matter (BLM) has morphed into America’s newest terrorist organization. As noted previously, the inner city neighborhoods of America’s most notorious cities were once bastions of tranquility. Unlocked doors were places where children could run in and out of, and darkness brought dreams not dread. The hellish living conditions seen today were created by the same people who now chant about the injustice of it all. Where once people asked for just a fair chance, they are now told to seek retribution and compensation. Exchanging freedom for the chains of dependency and despair, families are abandoned for an easy life of government handouts. Out of the ensuing chaos, so called community organizers and political activists grab power for themselves. Not willing to rest on their laurels, the same forces now seem intent on wiping the last vestiges of independence and hope from inner city America. Like a flesh eating bacteria, or a group of psychotic cannibals, the left are relentless in pursuit of their goals. A zombie apocalypse of mindless minions seeking the destruction of all they know, without ever totally knowing why. It does not matter by what name they call themselves;socialist, communist, progressive, fascist, modern liberal, or social justice warrior, operationally they are all the same. Provocateurs, their progeny are hate, division, rage and disillusionment. No wonder that they are responsible for the greatest atrocities the world has ever known. Today, nothing short of complete annihilation of social order will satisfy their lust. On college campuses free speech is demonized, in cities jail awaits Christian businessmen who follow their conscience, while massive immigration is being used to dissolve the bonds of community and national unity. Schools are now more concerned with propaganda meant to undermine parental influences than teaching. As white privileged, antisemitism, judicial activism, and social justice are juxtaposed for math and history, people wonder why the educational system is in such decay. Relentless in the pursuit their own Never, Never Land, they seek to create what has never been, nor can ever be. Promising paradise, they only deliver ever deeper levels of hell. Ignorant fools who eschew the wisdom of the ages, they follow a map whose lines they draw as they go along. This is the left, enemies of order and liberty, the real destroyers of worlds.